What might be called an international galactic manhunt has at last proved successful as a team of researchers has finally managed to locate the cosmic source of a high-energy neutrino. The trigger for this quest was provided by a single neutrino, which was detected in the ice of Antarctica by the IceCube Neutrino Observatory on 22 September 2017. Eventually, with the help of Earth- and space-based telescopes, the source of the neutrino was identified. It lies in a galaxy three billion light years away in the constellation of Orion, in which a gigantic black hole, a so-called blazar, acts as a natural particle accelerator. Involved in the search were scientists at 16 astronomical observatories across the world. Among these were Professor Sebastian Böser and Professor Lutz Köpke of the Institute of Physics of Johannes Gutenberg University Mainz (JGU), who have been members of the IceCube consortium since 1999. The results of this collective search have been published recently in Science. 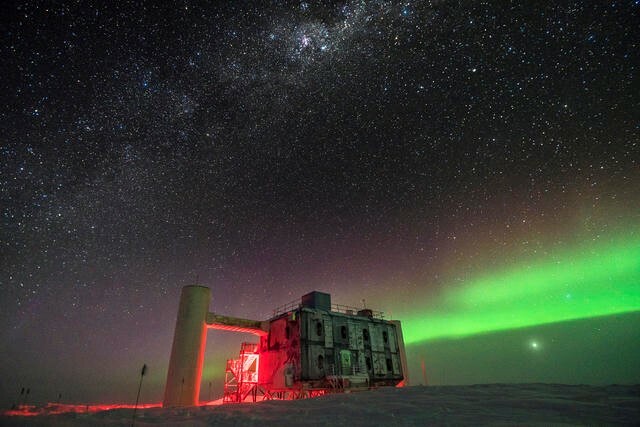 Following this discovery, the IceCube researchers decided to revisit their data collected over the last ten years in order to determine whether they had detected other emanating neutrinos from the same location. What they found was a remarkable temporary excess of high-energy neutrino events between September 2014 and March 2015. The probability that this excess is nothing more than a statistical outlier is rather low and was estimated to be of the order of 1:5,000. The result is reported in a second paper, also published in the same issue of Science. The projects undertaken with leading contribution of researchers in Germany have resulted in the first credible identification of an actual source out in deep space of these extreme high-energy particles. Such cosmic ray particles are primarily protons and nuclei that continually bombard the Earth's atmosphere. High-energy cosmic neutrinos represent a particularly informative form of evidence as they can reach us after travelling vast distances in straight lines without being deviated from their path or absorbed. The identification of the origin of the single neutrino confirms the hypothesis that so-called active galaxies with an exceptionally heavy black hole at their nucleus can also act as the accelerators of these cosmic particles. Experts see the coordinated observational program as a major success for the new discipline of multi-messenger astronomy that combines diverse forms of evidence such as electromagnetic radiation, neutrinos, and gravitational waves. The corresponding information is captured by means of a range of detectors and telescopes located across the entire globe and out in space. "This is an extraordinary achievement that was only made possible by outstanding collaboration and the systematic exchange of information between the observatories," emphasized Professor Sebastian Böser. The international IceCube team consists of some 300 scientists from 12 countries. The project is run under the auspices of the US National Science Foundation. Germans, after Americans, form the second largest group within the team. In addition to researchers of the German Electron Synchrotron (DESY), scientists from nine German universities are participating: RWTH Aachen University, Humboldt-Universität zu Berlin, Ruhr-Universität Bochum, TU Dortmund University, Friedrich-Alexander-Universität Erlangen-Nürnberg, Johannes Gutenberg University Mainz (JGU), University of Münster, the Technical University of Munich, and the University of Wuppertal. "Successful research associations are characterized by an active swarm intelligence and creative collaboration in all relevant areas," emphasized Professor Lutz Köpke. "Among other things, doctoral candidates working here at JGU supplied the algorithms that were essential for the precise location of the neutrino source." One process that results in the generation of neutrinos is the nuclear fusion that occurs within our Sun. Every second, some 60 billion solar neutrinos pass through an area no larger than a human thumbnail without leaving a single trace of their presence. Because of this weak reactivity, extremely complex methods involving the use of massive detectors are required to observe – with a bit of luck – the occasional rare reaction in which these ghost particles are involved. At the IceCube detector, researchers bored 86 holes each to a depth of 2,500 meters in the ice of Antarctica. They then lowered 5,160 light sensors into these holes, creating a detector that extends over a full cubic kilometer. The sensors register the tiny flashes of light that occur when one of the rare neutrino reactions occurs in the ice. It was five years ago that IceCube first captured evidence of the flux of neutrinos from outside the solar system. These have a much higher energy level than solar neutrinos and can thus be readily differentiated from them. However, until their recent successful manhunt caught the culprit in the net, scientists had been unable to locate a particular source of these cosmic neutrinos. The teams headed by Böser and Köpke are focusing on looking at supernovae as possible neutrino sources. They are able to contribute potentially helpful input to other experiments within minutes. They are also analyzing in detail neutrinos produced in the Earth's atmosphere as these can be used to determine the properties of neutrinos precisely and thus ascertain whether these deviate in any way from the Standard Model of particle physics. They are additionally examining the characteristics of neutrinos from deep space. "In order to more accurately establish the paths, energy, and types of detected neutrinos, we employ complex algorithms that utilize all the finer aspects of the data. We are also busy developing new optical sensors that can be used in and for the calibration of future ice neutrino detectors," stated Böser. The former Mainz-based physicist Dr. Benjamin Eberhardt will be spending a year at the South Pole from autumn 2018, where it will be his task to ensure that the experiment and the corresponding computer technology of the IceCube Observatory run without a hitch. A member of the IceCube team outside the research station in the Antarctic winter. A LiDAR laser beam being used to measure the atmosphere can be seen emanating from the station. In the background are the aurora australis and the star-studded sky.